Last night, UTArlington and Arlington Camera hosted a discussion of the noted documentary photographer (and Magnum member) Alec Soth with the curator who gave him the first big push of public recognition, Anne Tucker of the Museum of Fine Art, Houston. These public conversations are always useful. It’s true that most probably the information they reveal can be easily found elsewhere. 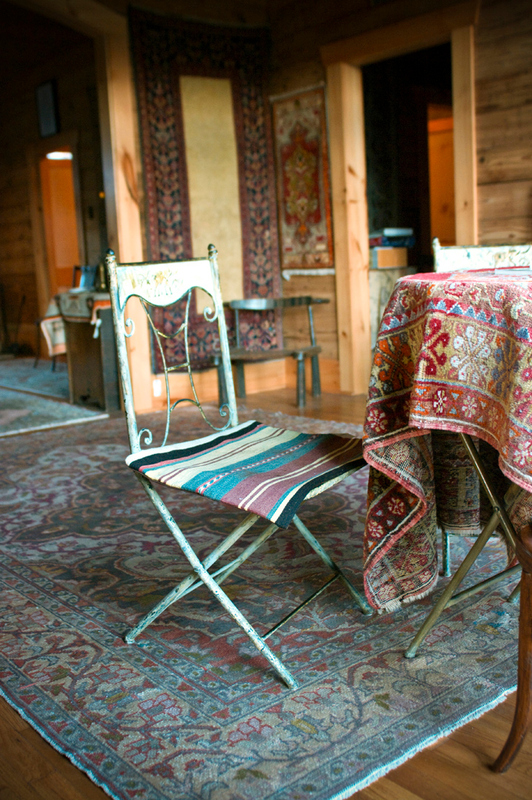 But there are always revelations that happen only in a face-to-face setting. 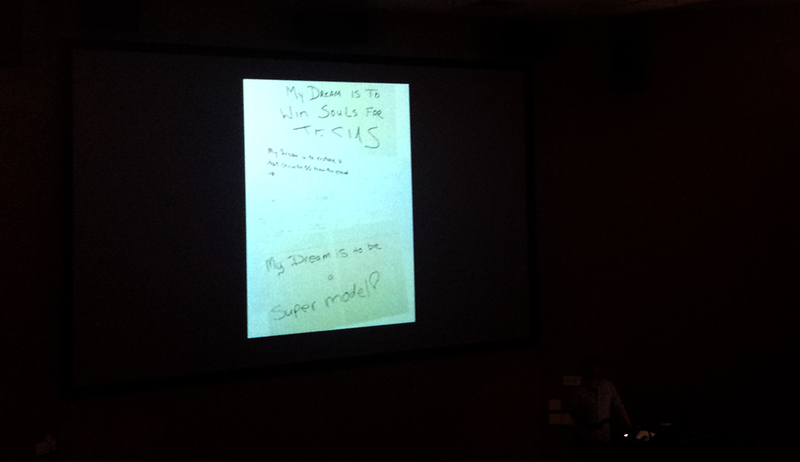 That’s the reason I used this particular image as an illustration for my post: Alec in the shadow and, on the screen, a note scribbled with the personal dreams of the people he has photographed. It is an approach he uses to get closer to his subjects and allow them to show something of themselves and make it visible in the portrait. Posted on November 5, 2013 | Enter your password to view comments. 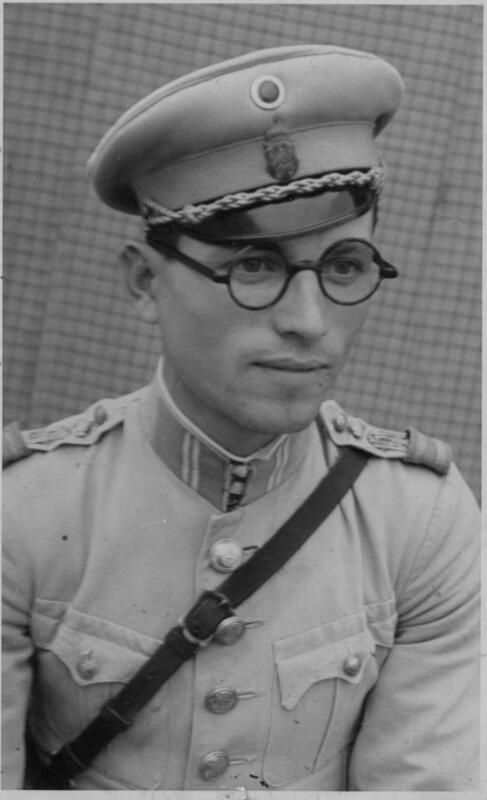 This is a portrait of my grandfather, taken while he was doing his military service in 1940 Bulgaria (not part of the Axis yet). I discovered it last summer while perusing the stack of family photos at my parents’ house. And it was one of the delights of my summer. I saw, in this picture, something in him I had not known but was so excited to discover it. I saw how he felt in that particular moment of his life and some truths he never told me; things I would’ve discussed with him if only he were around today. This picture gave me back a great piece of my own personal puzzle that I didn’t know existed but am so glad I found. 1. You see images everywhere. Not just people, places and things, but images with deeper meaning behind them. You enjoy the new sights in a different way. On my flight from Milan to Hamburg last week, I saw the two flight attendants working the aisle with trays in their hands. When they tried to pass each other, they faced in opposite directions and lifted the trays up simultaneously. An instant, beautiful, graceful image that struck me as a lightning – and made me sad since my camera was packed under the seat… You can’t stop being a photographer even if you have something else on your mind! 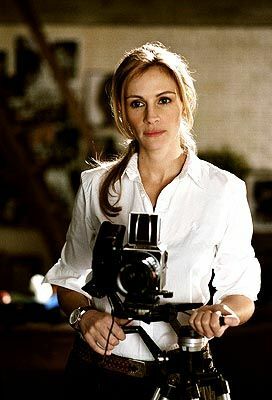 Julia Roberts as photographer Isabel in "Stepmom"
I started my blog tradition of photography-centered movie reviews with the intention to discuss the photographic aspect of certain iconic films. But so far those reviews have focused on something else rather neglected: the role of photography and photographers in society. (See my posts on Everlasting Moments, in which photography empowers a woman in an abusive relationship, and The Bridges of Madison County, about a photographer whose job is to discover beauty but also deprives him of social ties). My photo Grandma’s Dress will be part of the Day of the Dead exhibit at the Bath House Cultural Center in Dallas, from October 17 to November 14. Taken in Bulgaria last summer, at my grandparents’ house.